In a previous post on the NSHS blog, we told you about Nebraska’s twelve post office murals, as presented in Robert Puschendorf’s new book Nebraska’s Post Office Murals: Born of the Depression, Fostered by the New Deal. One of the murals with a fascinating story and intense attention to detail is the mural on display in Minden: Military Post on the Overland Trail. 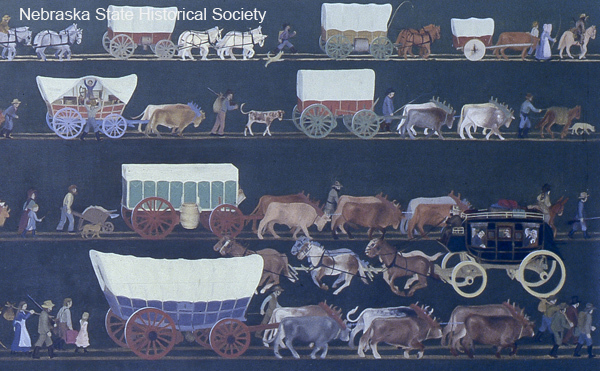 Along the bottom of the mural marches a trail of wagons, animals, and people, each with personal detail. Bunn’s sketchbook contains drafts of individual costumes and people, as well as his sources. Detail from the bottom right of the mural. Enthusiastic about the subject, Bunn spent considerable time, sometimes months, on each draft and revision of the work to ensure accuracy. He invited historians to see the full size cartoon and offer final suggestions. Upon completing the final product, Bunn wrote, “I am now content to let the mural leave my studio without any regrets for the time and efforts I put into it.” The Minden postmaster and community were impressed with Bunn’s attention to detail, and they happily received the mural. If you would like to learn more about Nebraska’s Post Office Murals: Born of the Depression, Fostered by the New Deal, or if you are interested in ordering a copy, visit nebraskahistory.org/murals or call 402-471-3447.